On Saturday, September 29, the Rochester Area Literacy Council (RALC) kicks off its professional development offerings for the 2012-2013 school year. “Practical Applications of the Common Core” will feature Genesee Valley BOCES Instructional Services Coordinator Molly Corey who will share the New York State Education Department’s vision for implementing the Common Core Learning Standards as well as instructional strategies that work to support implementation. The session will be held at French Road Elementary School in Brighton from 9 a.m. to noon. Registration for this event is due by Wednesday, September 26, and is $10 for non-members and $5 for members (self-pay). Participants who submit a conference request form may earn professional development hours. For more information, please contact your school’s Professional Development Policy Board Representative. The Smithsonian American Art Museum invites you to join colleagues from across the country for an exploration of the connections among American art, technology, and your curricula. The museum is sponsoring two week-long institutes in Washington, D.C. and the opportunity to stay connected with newfound colleagues and museum staff following the institutes. Institutes will be held July 9-13, 2012, and July 30-August 3, 2012. Teachers of core subject areas for grades 6-12 are encouraged to apply; however, priority will be given to ELA and social studies teachers. Online applications are due April 2, 2012. A limited number of $500 scholarships for institute participation are also available. Scholarship applications are due April 30, 2012. Back on February 14, I posted information about the Genesee Valley Writing Project’s Summer Institute for K-12 teachers. I have just learned that the application deadline for the institute has been extended to March 15. I hope you will consider taking advantage of this opportunity to learn more about teaching writing from colleagues and from previous institute fellows. Here’s an opportunity to learn more about teaching writing. Applications are due March 1. Past participants from Greece Central include MR Maier (a co-facilitator), Alaina DeSiena, Andrew Farmer, Jan Marchetti, Jeanmarie McLaughlin, and Jean Zannie. The GVWP offers a three-week annual invitational Summer Institute, which is the centerpiece of the Writing Project experience. The GVWP awards fellowships to a group of teachers from all disciplines and at all levels of instruction, pre-kindergarten through university. Teachers participating in this three-week Institute will have the opportunity to study successful classroom strategies for teaching writing by participating in teacher demonstration workshops. They will read and discuss research in self-selected reading research groups and improve their knowledge of writing by engaging in a collaborative community of writers. Presentations and field trips during the Institute will highlight the local and national resources and expertise available through the National Writing Project network. The 2012 Summer Institute will be held on the University of Rochester’s River Campus from July 9 through 27, five days each week, from 8:30 a.m. to 3 p.m. Fellows must attend one mandatory Pre-Institute meeting scheduled for Saturday, June 2 and one Pre-Institute coaching session scheduled for Saturday, June 16, both to be held on the University of Rochester’s River Campus. 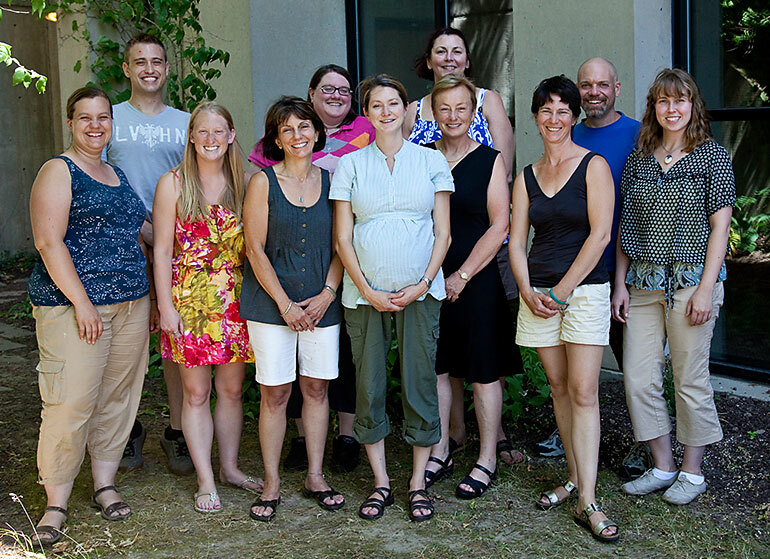 The GVWP will accept up to 12 Fellows for the 2012 Summer Institute. Applicants must be practicing teachers from any subject or grade level (pre-kindergarten through college level) who embrace writing and literacy as central components of learning in the classroom and who are looking for innovative ways to integrate literacy practices into student learning. We invite educators from urban, suburban, and rural regions of Monroe and surrounding counties to apply for the Summer Institute. Three graduate credit hours at the Warner School of Education (participants will be required to first use any employee tuition benefits or other applicable scholarships and tuition waivers, with the remainder to be covered by a Warner School tuition waiver – offer not applicable to currently matriculated Warner students); the chance to collaborate with outstanding colleagues; membership in a local and national network of Writing Project Fellows; and approximately 100 hours of professional development may be used toward your district’s PD hours requirement. Application packets should include the following: (1) application cover page; (2) one to two page personal statement based on the prompts provided in the application; (3) sample writing assignments and/or student work samples to support the personal statement. Applications will be reviewed on a rolling basis. Qualified applicants will be invited for a 30-minute interview with the director/co-directors at the University of Rochester’s River Campus. All interviews will be scheduled by March 31. The final notification of the Summer Institute Fellows will be issued by April 15. For more information about the 2012 Summer Institute, please call Joanne Larson at (585) 275-0900 or e-mail her atjlarson@warner.rochester.edu. The community of teacher leaders formed during the Summer Institute becomes the foundation for the continuing work of the GVWP. Writing Project Fellows are encouraged to stay involved with our local and national Writing Project network and are supported in developing community outreach programs, school-based inservice workshops, collaborative partnerships, and teacher study groups to support the goals of the National Writing Project in the Greater Rochester community.